The plaque commemorates the seven men from Woodvale who died in service or were killed in action in World War One. 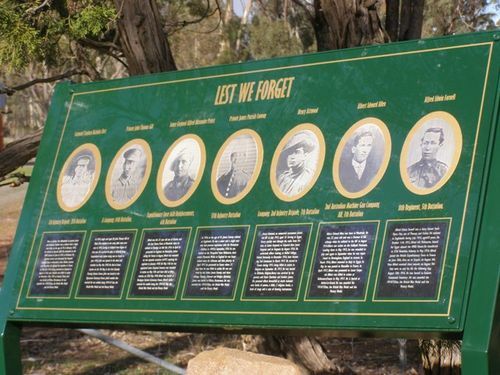 The plaque stands alongside the memorial markers in the A.I.F Memorial Avenue and contains a photo and a short biography of each of the deceased soldiers. A plaque to commemorate the lives of Woodvale's fallen servicemen will be unveiled on Friday. The tribute will be unveiled at a dawn service at the Woodvale Memorial Avenue, in front of the community hall in Daly Road. The plaque features photos of seven men and a short snippet about their lives. The plaque was made possible with a grant worth $1100 from Saluting Their Service and a $700 contribution from the Bendigo District RSL. Woodvale Hall Committee member David Vaughan donated a collage of photos. Bendigo Advertiser (Vic), 24 April 2014.